Those who watch Still No Idea at the Royal Court this winter are likely to be left asking the same question as this “white, middle-class and not disabled” audience member no matter who they are whose question concludes this thought provoking two-person piece. Lisa Hammond and Rachael Spence met as actors on a show touring the world. The two are very similar, bar one obvious factor: Lisa is disabled and Rachael isn’t. Ten years ago, the pair came together to make No Idea. They went onto the streets to ask the public to imagine a show the two of them would be in together. The public’s reaction was hilarious and painful in equal measure. Initially they expressed an honest desire to put Lisa centre stage, reflecting sincerely held inclusive attitudes. So far so good. But could they really think up a story where Lisa and her “cheeky face” – an inspiration for the hilarious and suitably-named Cheeky Face song – got a decent chunk of the narrative? Frank, funny and eye-opening, this no nonsense double act flits easily from banterous musical number to witty sketch, jaw dropping realities and heart-breaking facts. The two actors reveal hard truths borne out by their own experience that shows that, while diversity may be the word of the moment, deep meaningful change is a long way off. By not hedging around the subject and giving Lisa as much of the mic as her able-bodied counterpart, the audience is forced to recognise that there are societal, cognitive and personal shifts that need to happen. So, what can we do? Simple. Imagine a story where a disabled person really does get their fair share of the script. As a creator of the play, Lisa’s voice is heard and a true story is told for and by a disabled actor. 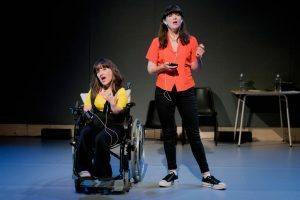 This play is a call to put more disabled people in the driving seat and a fantastic example of just how good the results can be.